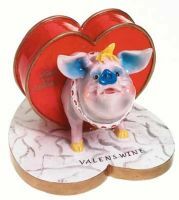 Happy Valenswine's Day, you swine. If February 14 is a Hallmark holiday, the 13th should be sponsored by Victoria's Secret. The night before Valentine's Day, as hush-hush tradition goes, is when every cheater in Manhattan will be out wining and dining his or her other significant other. Call it Valenswine's Day. You can't take your mistress or boy toy out on the big day itself, for fear of getting busted - but on the 13th, anything goes. Said to be an old British custom, the practice is alive and well right here in New York. "When I first started in the business, I said, 'This is very strange; the 13th is so busy,'" recalls Four Seasons restaurant manager Julian Niccolini, who says that night's often even busier than the holiday itself. A middle-aged, divorced New York professional, who asked to remain anonymous for obvious reasons, concurs. He dated two women for years on end, without either being the wiser - thanks largely to the benefit of having two offices in two different cities (also known as the 50-mile rule, defined as the principle that your spouse and your lover should never live closer than that to one another). "I think it's a common thing," he says of the February 13th tradition. "If you're dating more than one person at a time, you have to go out the day before and the day after."